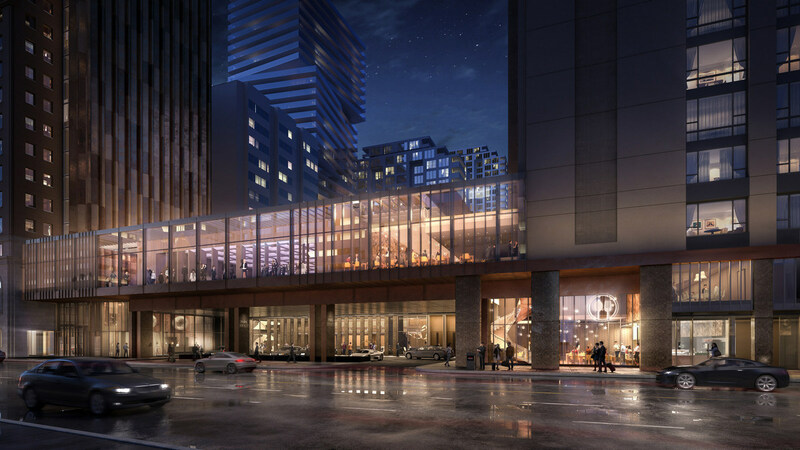 Oxford Properties Group, the global real estate arm of OMERS, has revealed designs for its redevelopment of Park Hyatt Toronto. 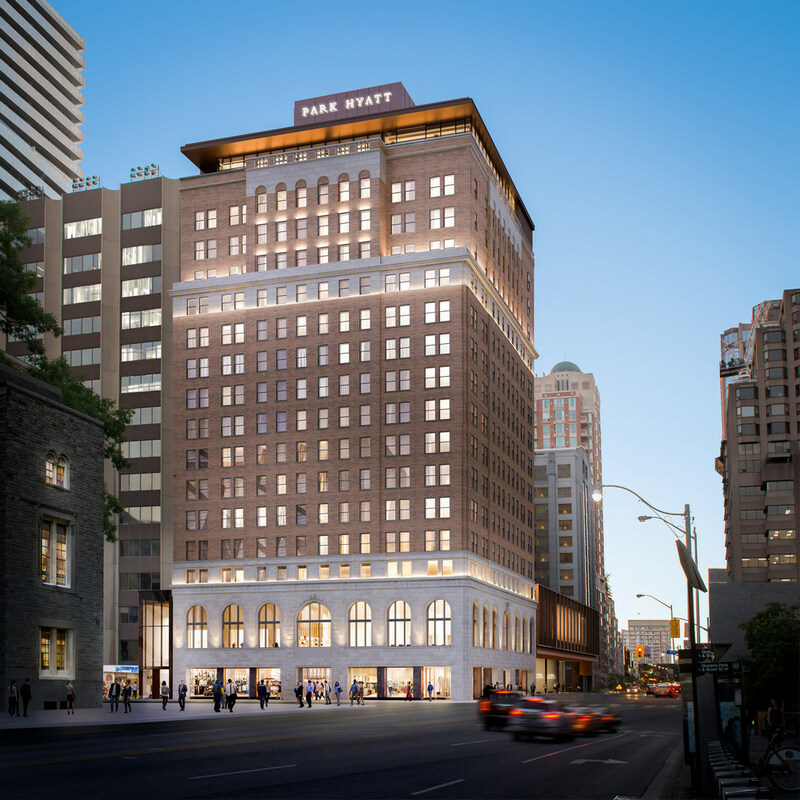 Long considered to be one of the most venerable sites in Toronto, and one of the most iconic addresses, Park Hyatt Toronto will be fully modernized through Oxford’s plans that will restore the buildings to their true landmark status. 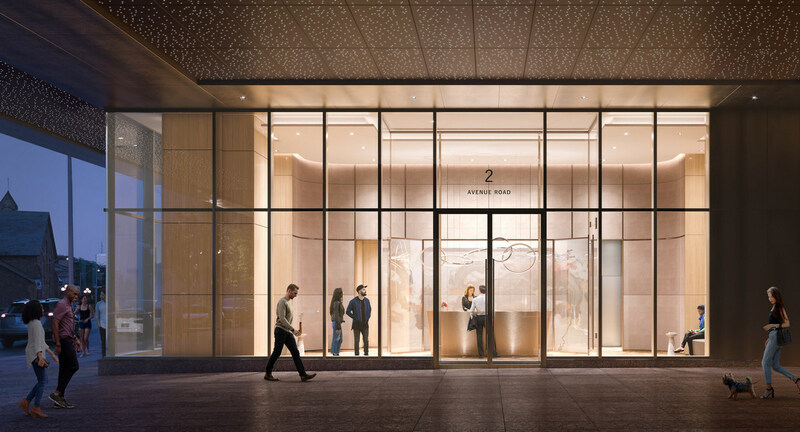 The plans create 65 luxury rental apartments at Two Avenue Road, the site’s heritage South Tower, 40,000 square feet of high-end retail and restaurant options throughout the complex, and a 219-room luxury Park Hyatt hotel in the site’s North Tower. The heritage-designated South Tower will be completely retained and restored, making it the first high-rise in Toronto to be totally retained in an adaptive re-use project, preserving it for generations to come. The project is already under construction and slated to re-open in early 2020. The interiors of both The Residences at Two Avenue Road and Park Hyatt Toronto are being designed by the world-renowned Studio Munge. The project’s design palette, materials and finishes are a celebration of Canada that will provide hotel guests and residents a true sense of place. Both the hotel and residences feature local Canadian materials throughout including limestone flooring sourced from Owen Sound. “The design of Park Hyatt Toronto and The Residences at Two Avenue Road is rooted in creating a true sense of place by connecting the iconic experience with Canada’s undeniable beauty. With this fundamental principal, we found inspiration in the Group of Seven who also drew from nature. We admired how they captured their surroundings within art, and we evolved this concept into its design. The essence of Canada’s landscapes and diverse seasons are modernized throughout every area and enhance the guest’s journey as they move from public spaces to intimate guestrooms and residences. Bespoke details such as carpet designs informed by autumn leaves, and Canadian-stone performing as expressive accents honour what the country has given to us,” added Alessandro Munge, Principal, Studio Munge. The project’s architecture is being designed by KPMB Architects, known for its heritage work including the Royal Conservatory of Music and the ongoing revitalization of Toronto’s Massey Hall. Oxford specifically chose two Toronto-based but globally renowned firms for this project, KPMB Architects and Studio Munge. The companies’ local roots helped ensure the importance and heritage of the original Park Hyatt Toronto site was conscientiously reflected in its new form. 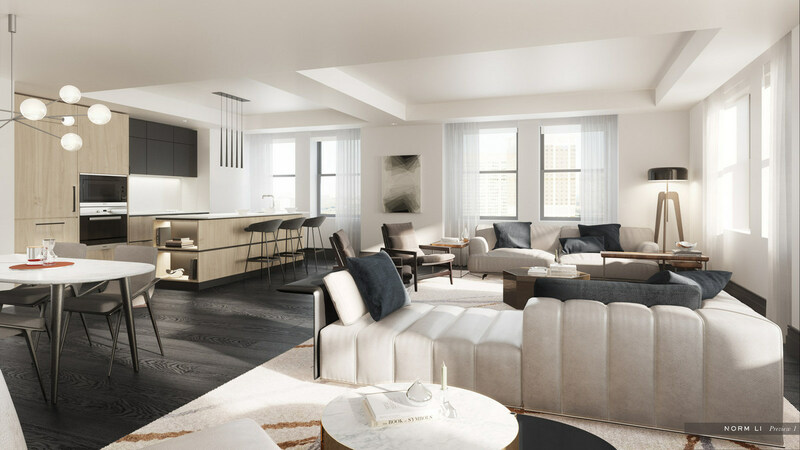 The Residences at Two Avenue Road will feature 65 one- and two-bed rental apartment units, including five penthouse suites, which will range between 900 and 1,800 square feet. Pre-registration is now open for the Residences. Residents will enjoy an unrivalled experience through a 24-hour concierge service, complimentary access to Park Hyatt Toronto’s fitness centre and al fresco dining on the 2,500 square-foot outdoor terrace outfitted with an adjoining luxury kitchen. The apartments enjoy the luxury finishes and appliances that befit the building’s history and reputation, including floor-to-ceiling kitchen cabinetry, and offer some of the finest and best protected views in Toronto. The 219 Park Hyatt hotel guestrooms in the North Tower will include 38 well-appointed suites, including a presidential and two multi-level suites, a redesigned lobby experience and a new 8,000 square foot Stillwater Spa with 13 treatment rooms. The connecting pathway between the North and South towers will be replaced by an expanded multi-level podium that will house the hotel lobby, a ground-level premium-upscale 10,000 square foot restaurant with a roof deck overlooking Yorkville, and 14,000 square feet of meeting and event space, including a new, 600-person capacity ballroom. The complex will also feature 20,000 square feet of prime retail in the restored heritage South Tower with 100 feet of frontage along each of Bloor Street and Avenue Road. The retail space will comprise two floors of 10,000 square feet, with the second floor enjoying double height ceilings that give the opportunity for 30-foot clear heights with a mezzanine level.